OK, simple: there has never been a motorway built called the A2(M) in England. What on earth is it doing here then? Well, you see, there was an error in certain editions of atlases, one of which being Bartholomew's 1968/69 edition. Yes, I certainly am. So why was such a mistake made? When this section of the A2 was upgraded, it was to a very high standard. Much higher, in fact, than the older M2 to the east. This lead to the rather odd situation of the signposts on the road changing from green to blue, and the road getting narrower, not wider! Fortunately, the recent M2 widening works has rectified this little oddity. Why do I get the feeling that you're not saying everything? "Tale I heard about this was that the main A2 carriageway, from Three Crutches (start/end of M2) to Swanscombe cutting was going to be motorway (and hence A2M) but Dept of Transport boo-boo-ed by not leaving an alternative route for non motorway traffic in its plans, - any alternative would have been very tortuous through Gravesend etc - by the time this was realised I gather it was nearly built, so they wee unable to open it as a Motorway, so it had to remain as "Motorway class" dual carriageway This would seem to tie in with your map, which indeed shows the main A2 past Gravesend as a Motorway (and not the M2 but A2M as you suggested)"
Having lived near to what would have been the A2(M) for virtually all my life, I have always wondered what the 'old A2' looked like before being dualled. Has anybody got any photographs from years gone by? To view what the old A2 looked like, Bexley Council has a plethora of photographs from the early 1970s when the A2 dual carriageway was built from Swanscombe to Eltham. With this, you will see some photos from 1963, 1969 and 1971 when you could see the three-lane road as it was from the 1930s. The original 1930s bridge over the railway is still present outside Bexley and some of the old pre-1972/3 junctions can be seen off the side roads. I was brought up in the Medway Towns (born there 1962, moved away 1980). The A2 dual carriageway was often referred to in the local press as A2(M), which I always knew was wrong - although I wasn't aware of Bartholomew's Error as reported on your website. The new A2 Dartford outer bypass was built in the 1970s with a ridged concrete surface, as was current standard practice. This meant that cars' tyres screamed between about 65 and 80 mph, but were quiet again at higher speeds (remember - pre-1974 oil crisis, the "national speed limit" was unrestricted). This caused much alarm; eventually, several years later, warning signs were put up. Then, even more years later, the road was resurfaced in tarmac. South-west of Gravesend, the A2 passed underneath the old branch line railway into Gravesend West Street. The old bridge (1930s?) carried a double track railway. 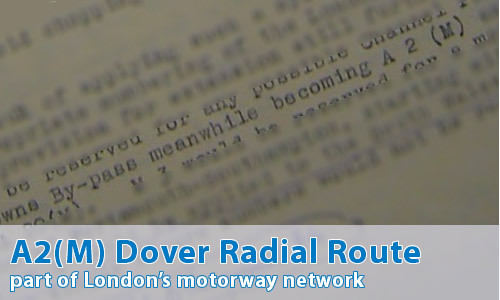 When the road was widened to dual carriageway, the railway was just single track. The old bridge remained as double-track width; the new part of the bridge was built to carry single track only. All of this was swept away in the last few years by the road works in connection with widening the A2 and building the new junction for Ebbsfleet International station. Coming down the hill (eastbound) from Swanscombe, in the right-hand lane at 70-ish, that right-hand bend felt decidedly sharp and uncomfortable! Ironic that slower traffic in the left hand lane has a smoother ride round the outside of the bend. It's much better now that the road is four lanes wide (with a hard shoulder?). Have they increased the cant or something?